Starting the new school year is an exciting and stressful time for teachers. This page (which is excerpted from The Cornerstone book) will help you plan and prepare for the first day of school while maintaining your sanity. If it’s any consolation to a stressed-out teacher in August, let me assure you, the start of school is definitely the hardest time, and things WILL get easier as the school year progresses! I think that’s good news, because we as teachers get the worst part over with right away. There are days in the beginning of the year in which you want to collapse by noon because you are so exhausted/ That’s totally normal, even for veteran teachers! So if you’re close to having a nervous breakdown and school hasn’t even begun yet, be encouraged. There will be other stressful points in the year, certainly- but by the end of September, you’ll be over the first- and biggest- hurdle. There is light at the end of the tunnel! The truth is that creating, introducing, modeling, and reinforcing your procedures and routines is the most critical task you will need to focus on and accomplish in the beginning of the year. 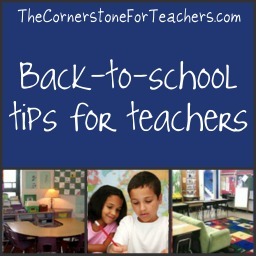 You will be setting the tone for your class throughout the first several weeks of school. You will be constantly reinforcing your rules and routines because you can’t teach all of your procedures on the first day, and students need lots of modeling and practice. Plan ahead–what will you do on the SECOND day of school? It’s important to think out how you will reinforce your routines the following week, and the week after that. (Don’t worry, I’ve created an entire section of my website that’s devoted to showing you how to create, introduce, and reinforce routines and procedures). The second misperception comes from the wealth of resources about what to “do” with the kids on the first day of school. You teach them, that’s what! Rules, routines, procedures, and then academics as soon as possible. You don’t need a bunch of cutesy get-to-know-you games mixed in with “curriculumlite”–in fact, many principals are cracking down on this tradition and insisting that new curriculum be taught on the first day of school. Whether you think that’s too extreme or not, the best teachers do get procedures in place quickly so they can get down to business right away. You only have your children for 10 months- you cannot afford to waste a week or two on back to school activities. The exception to this is when those activities are educational, but that is seldom the case- the purpose is generally to get kids acclimated and ready to learn. If students know your expectations and procedures, and your classroom tone is safe and inviting, students will adjust easily within your regular curriculum and routines. The most important thing you can do is plan out your routines (the regular procedures). All of them. Pencil sharpening, bathroom privileges, passing in papers, even stacking chairs on desks at the end of the day. Figure out exactly what you want kids to do, and how to communicate those expectations to them. The more specific you are, the less room there will be for students to misinterpret or push the limits of what is acceptable. Write down the procedures you plan in case you forget or if you are put on the spot, and leave the list for substitutes so they can reference it when needed. Don’t worry, you can always change things later. It’s better to say to students, “You know? I don’t thinking this way is working, let’s try this” than to let the classroom be a free-for-all until you have it all figured out. (By the way, even after thirty years in the classroom, you won’t EVER have it all figured out. I still try new procedures and routines every year, looking for the optimal way to make my classroom run smoothly. That’s part of the art of teaching- enjoy the possibilities!). You can’t teach it all the first day. You have to prioritize which routines must be taught first thing, which can be taught later in the day, and which can wait for later in the week. How to move about in the classroom (no running), where to hang coats and backpacks, and hand-raising policies are things you will probably cover as the situations arise naturally within the first half hour of the children being in the room. Later, you can practice hall behavior, bathroom expectations, pencil sharpening routines, and rules/ conflict resolution. (With my Pre-K children I would talk about friendship and respect as soon as the class was settled down, so that I could begin to model problem solving, rather than spend the day intervening in conflicts. Young children are in school to learn social skills, so I think that is appropriate. With elementary-aged kids, I generally wait until the afternoon or the second day because they already have some knowledge of what is appropriate and what isn’t in school). In the afternoon, you can teach them how to head their papers, homework procedures, and dismissal routines. On the second day, you will explicitly reinforce what you have already taught, and add things such as how to pass in papers, distribute supplies, and participate in teaching techniques you plan to use (think-pair-share, partner reading, noise level monitoring devices, three-before-me, etc.). On the How to Create Class Rules page, you’ll learn the difference between rules and procedures, how to set class rules/goals and introduce them to children in the beginning of the year, and find guidelines for choosing logical consequences. Remember the purpose of your back to school activities- to set up an environment conducive to learning and reinforce procedures and rules so that you can begin to teach the curriculum as soon as possible. If an activity does not contribute to that goal, why use it? If you are a beginning teacher (or a veteran who gets easily stressed out), keep it very,very simple. You can always try those elaborate lessons later inthe year, or next school year. Pick activities that require very little planning and prep work on your part, and that use few materials.You don’t want to be in the middle of a project and realize you don’t have tempera paint or pipe cleaners, because your students will require your constant and full attention on the first day of school. Choose several activities which your students can do independently, even if it’s asimple word search or coloring page.You may not plan to use them, but if an urgent issue comes up, you need to have something to engage the students. You may also need a few minutes of ‘down time’ for yourself. The slideshow below features some excellent books to read aloud during the first week of school. Many of them address students’ fears, while others help you set classroom expectations. I’ve also included a few teacher resource books that I think have great back-to-school activities. Also, on the 5 Pro-Active Strategies page, I’ve included book recommendations specifically designed to help you set expectations–they’re great to read during the first few days of school. You can introduce academic concepts on the first day if you and your students are ready, the second day at the latest. Your activities could be as simple as a Mad Minute addition drill kids that love, a spelling game, or map activities- you don’t have to get into the text immediately, but do start working. The children are there to learn, not to get to know each other- after the second day, let that part happen naturally. Procedures and routines can be built right into academic lessons. For example, plan a shorter-than-normal writing prompt so you can spend fifteen minutes teaching how to head papers. Plan a brief math lesson using manipulatives so you can introduce the items to the children and practice using them correctly first. This will depend on your comfort level, how well you have established routines, how mature your group is, and of course, the requirements of your administration. Usually, between the third and fourth weeks of school is about right. However, this is a slow process. It’s a critical part of two of the most important tasks you will tackle this year: maintaining order in your classroom and teaching your students to read. It takes considerable time and attention at the beginning of the year to make the process run smoothly. I would advise you not to worry about reading groups before school starts, because you’ve got more immediate matters to attend to. What if I’ve forgotten to plan for a procedure or routine? While it’s important to plan things out in advance, it just isn’t possible to prepare for every eventuality. The good news, whether you realize it or not yet, is that teachers are good at thinking on their feet! Handle newsituations as they arise–it’s better to have to change a procedure than to not introduce one at all and let the kids run the show however they want. Just remember that your students will have to un-learn any routines you create (or don’t create, and therefore don’t enforce) once you know what you want them to do. You can find information about planning for arrival/dismissal routines, bathroom/hallway/water fountain procedures, collecting/distributing papers, and more in the Routines and Procedures section of this website. How do I prepare when I don’t have a classroom or can’t access it yet? In those situations, the best thing to do is gather your ideas and plan your routines. That year, I used my summer to do lots of research on word walls and morning messages, plus I made centers that I knew second graders would need no matter what the curriculum looked like (since I didn’t have the documents yet). Try to get in contact with other teachers in your district who can explain things to you. You can also go to your school and school system’s website. Take a look at your union contract (which is probably available online) and take some time to get to know the district expectations–and your rights. If you read your contract, you can most likely find out how many hours your workday is, how much planning time you are entitled to, how many mandatory meetings can be held, and other info that is important to keep up with. You won’t have time to read that once school starts, so it’s a good thing to do early on. There’s no point in stressing out or worrying, so take a deep breath and try to relax! I think every new teacher (and most veterans!) feel this way at the start of the year. Teachers always go around asking each other, “Are you ready? Are you ready?” and we all roll our eyes and say, “No, even if I had another week I would still have a million more things to do.” The good news is, not everything has to be done before the first day of school. Remember: You don’t have to grade anything right away. Don’t stay after school the first week marking papers–get your room and lessons together! It’s important not to let things pile up, but prioritize. You have eight more weeks before grades are due. What do I do with the supplies students send in? Children come in on the first day of school with all kinds of cool supplies, half of which weren’t on your list. They’ll also continue to bring in supplies during the first few weeks of school, especially in impoverished communities in which parents wait to shop until the payday after school starts. Have notebook paper and pencils ready to loan to those who come to school with nothing in their backpacks and decide how you will handle returning supplies you’ve lent out and the possibility of borrowing from other students. What if school is starting and I feel like my classroom still isn’t set up or organized the way I want it? That’s okay! Everything doesn’t have to be in place right away. Setting up takes awhile, and you’ll want to change things as you figure out how you want to use materials and space. I like to rearrange all year long. It takes the pressure off me in August because I know nothing is permanent, and I get to adapt things to accommodate the children’s changing needs. Is it normal to develop an eye twitch because I’m on complete information overload? YES. Even veteran teachers who have been at the same school teaching the same grade for years feel this way every August…if you don’t believe me, ask them! Teachers have a TON of information thrown at them during the fall, and between technology glitches, curriculum gaps, and procedural omissions and misinformation, EVERYONE feels like they’re getting way more information than they could ever possibly retain. Take good notes and keep your handouts organized and easily accessible (try taking your notebook and teaching guides home at night to review). It won’t be like this forever, I promise! Usually by the second week, I feel like I’m in my groove, and most new teachers begin feeling this way sometime during the first quarter. There is an end in sight! The beginning of the year is the most physically and intellectually draining for everyone, but you won’t be falling into bed exhausted EVERY night for the entire year. Be prepared to work extra hard now and you will reap the benefits quickly. And whatever you do, remember that feeling overwhelmed is completely normal, and that even if other teachers aren’t showing it, they’re experiencing beginning-of-the-year stress, too. You’re not an idiot because you’re unable to process everything the first time you hear it. It’s okay to do things wrong the first time, make lots of inadvertent mistakes, ask questions that have already been answered, have people repeat themselves, and get them to remind you of their names ‘one more time’. This website has been very helpful. Thank you for the compilation of great ideas. Thank you for all of your great ideas. It is so nice to be able to come to one place to get ideas. I also got your book it loaded with information and I am so grateful!! Thanks!! This is AWESOME! I am here planning for Monday (it’s Saturday) and I was on information overload. Thank you for your encouragement and your keep it simple approach. I am a veteran teacher and felt that all your info was dead on! THANK YOU! I appreciate that so much! It’s great to know my advice was helpful in keeping your perspective. Have a great year! It is time to update this post Angela. Teacher prep schools stress rules and consequences etc. on day 1. But, this is an outdated paradigm. The first few things a teacher does sends a message about what is most important to this teacher – rules and consequences. But it’s not what but who is most important – it is the students. That simple. Let’s welcome them. Be with them. Ask them about who they are. Let’s not tell them we care. Let’s show them we do. Also, they were gone for 2+ months- their days looked very differently. What happens on the first day of the new job? – you meet everyone, they welcome you, you talk, you are shown around. You are not told what to do or what not to do. Setting the tone can wait. Actually, it’s happening right now. Hey there, Oskar, you’re right that’s it time to update this article! It’s several years old. But regardless, I apologize if this page has somehow given the incorrect impression that rules and consequences should be the focus of the first weeks of school. That’s never really been my approach–rules are much different from routines. I can’t find the book recommendations. There is no slideshow. THANK YOU so much for your detailed writing. I am a new teacher in South Africa and found this really useful!